"Beloved, do not avenge yourselves, but rather give place to wrath, for it is written, 'Vengeance is Mine, I will repay,' says the Lord. Do not be overcome by evil, but overcome evil with good" (Romans 12:19,21). It is difficult to internalize Coptic Orthodox Church being told that it may not display a cross on the exterior of its building. The Holy Cross is a symbol of patient endurance and forgiveness. It is not a sign of war or contentiousness. It is beyond human understanding when new construction of a church building necessitated by a growing Coptic Christian population is considered unlawful. This is particularly disconcerting when the lawful means of expansion has been obtained through permits to build a new church. So how do we defend that which oppresses what we perceive is basic to our Coptic faith and inflicts harm on no one? We must and should abide in righteousness for fear of being overcome by the temptation to retaliate in actions that are hard to differentiate the good from the bad. We must be recognized for our conviction of faith, not our conviction to overcome hardship at all costs. "Religion is to be defended—not by putting to death—but by dying. Not by cruelty, but by patient endurance. Not by guilt, but by good faith. For the former belongs to evil, but the later to the good…For it you wish to defend religion by bloodshed, tortures, and guilt, it will no longer be defended. Rather it will be polluted and profaned…And, therefore, when we suffer such impious things, we do not resist even in word. Rather, we leave vengeance to God. We do not act as those persons, who would have it appear that they are defenders of their gods, who rage without restraint against those who do not worship them" (Lactantius c. 304-313). Peaceful gatherings of one voice to denounce church burnings, church destruction, and the removal of crosses from church structures are a means in which Coptic Christians seek to be heard. In a country where a minority exists, it can threaten no one when there are no weapons carried and no one has the planned intent to harm others outside their gathering. In a country where governmental democracy has not been firmly established, it has been proven that no positive goodness or advancement of a cause can be gained. Is it too much to ask that it should be seen as the right of human nature to worship as a Coptic Christian in Egypt where Coptic Christians have existed for more than two thousand years? The victorious revolutionary moment of Egyptian governmental restructuring needed the support of the Coptic Christians. It must therefore incorporate religious tolerance and moderation with the faith of its Coptic Christians allowed to be continued and preserved. This may not be the last time Coptic Orthodox Christians support will be needed in Egypt for obtaining democracy. The expression of justice and fairness by the Egyptian government will ensure the support of its Coptic Christians when conflicts arise against it. All Egyptian citizens aligned in support of its newly established government will only serve to make Egypt a stronger country, not a country once again divided against itself. 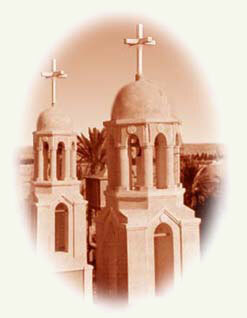 Church buildings are important to the Coptic Christians for worship. But far more important is that we commit to our hearts that we "are the temple of the living God" (II Corinthians 6:16). The cessation of the expansion of Coptic Orthodox Church buildings will not stop or deter the faithful. The faithful are the vessels of the True and Living God. Coptic Christianity has survived year after year for two thousand years, approximately 728,000 days, with the knowledge that for the faithful not one single tomorrow will be easier than the previous yesterday. The faithful Christians have flourished and multiplied under the veil of oppression. It would seem while Coptic Christians do not pray and celebrate the Divine Liturgy in open public places in Egypt but behind the closed doors of churches, those who are not Christians or strongly oppose Christianity would advocate the building of churches so that the worship of God can occur without the fear of subduing others or others having to witness something that they may not seek too. So why not encourage the constructions of an enclosed church in a country of those who may feel offense regarding Christianity to avoid subjection to it? Lately, many have died by the hands of those who oppose Coptic Christianity. Those who have died have not held guns in their hands, bullets in their pockets, or bombs on their backs. Prejudice against a minority population, Coptic Christians, by a few radical members of an opposing group that despises them not only inflicts injury to the Coptic Christian but prostitutes those of their own group who practice moderation and do not want to be imperiled by radicalism. While our beloved Egypt, the homeland to Coptic Christianity, sorts itself out and makes sense of herself, she must and will come to the conclusion of advocating religious tolerance that will need, not only the support of all its citizens, but will advocate the unity of all its citizens in what must be the optimal welfare and wellbeing of its country's preservation. Coptic Christians must be of good courage. Rational thinking and actions are called for in a country still within a military state with no elected leaders. Martyrs today, as two thousand years ago, are to be honored as well as their families who sacrificed and mourned their death. We are assured that their departure and desire to die for the Lord Jesus Christ will be rewarded. "All the martyrdoms were blessed and noble, and they took place according to the will of God…The martyrs despised all the torments of this world, redeeming themselves from eternal punishment by the suffering of a single hour" (Martyrdom of Polycarp, c.135). The blessed assurance of the heavenly life through a single hour of exhortations of asking for church expansion and construction as well as the right to hang a cross on building in which it is commonly practiced should be considered as having earned a crown of righteousness. Martyrdom is not considered rare, accidental, or derived from grounded justice. Every day we have abundant sources of martyrs and every day it seems we must remain advocates for justice. If justice means having the right to worship the Lord our God, then we must advocate so in peacefulness and love. "We call martyrdom perfection, not because the man comes to the end of his life, as other, but because he has exhibited the perfect work of love" (Clement of Alexandria, c. 195). Coptic Christians love Egypt. We want to live peacefully where we have made our homes and where generations of fathers have made their homes. We want to live and die in the country that has the bones of our families that have died and were buried before us. We want to worship the Lord our God where we peacefully attend church and where generations of fathers attended church before us. Coptic Christians want to work and give back to our country the sense of union, being one in the nature of man, and living in harmony to abide by fair laws of the land. Harmony within a country ensures the prosperity and honorable reputation of the country. The person who takes the blood of another cannot preserve in dignity. There can be no universal good to come from taking the life of another. It defends nothing. It celebrates nothing. In the fullness of time, we pray that Egypt will have new elected leadership where perhaps the Coptic Christians' needs can be addressed in a more respectable venue rather than the atmosphere of prejudice in where Christians are being hurt and have no productive outcome. St. John wrote, "When he opened the fifth seal, I saw under the altar the souls of those who had been slain for the Word of God and for the testimony which they held. And they cried with a loud voice saying; 'How long, O Lord, holy and true, until You judge and avenge our blood on those who dwell on the earth?'" (Revelations 6:9-10). "So all those in the synagogue, when they heard these things were filled with wrath, and rose up and thrust Him out of the city; and they led Him to the brow of the hill on which their city was built, that they might throw Him down over the cliff. Then passing through the midst of them, He went His way" (Luke 4:28-30). The Lord Jesus Christ was rejected in His own country, yet He did not accept death at the will of His opposition nor did He allow them to provoke Him, but at the Will of His Father in Heaven only did He accept the fate of earthly death. This is the example we must follow. We must not recklessly abandon the Will of our Father in Heaven and fall into the hands of the opposition; rather we must and should rise above those hands which seek to do us harm. I ask that all join me in raising prayers to our Egypt homeland, those we love and are concerned for their safety there, and for the leaders that are to come which should seek to unite us all as one nation.